Pin Out for Commodore 64 Power Supply - Pins 6,7 with no Volts?? Thread: Pin Out for Commodore 64 Power Supply - Pins 6,7 with no Volts?? 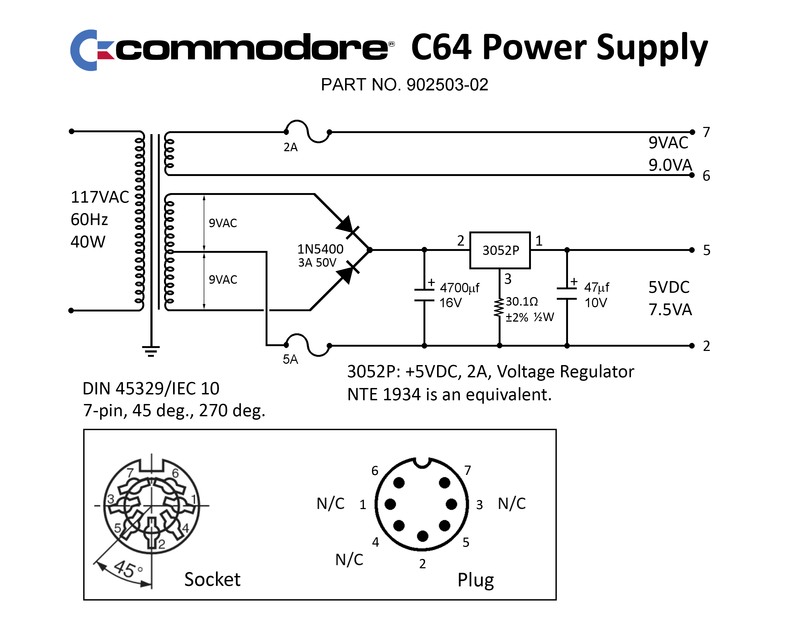 My Commodore 64 Power Supply shows pins 2 and 5 at +5 Volts ( 2= GND, 5 = +5V). Pins 6 and 7 are supposed to be at +9 Volts, but when the meter leads are "touched" to pins 2 and 6, and then 2 and 7, the meter shows +0 Volts. The power supply seems to work fine when connected to the computer. What gives?? I thought I replied to this one a day or two ago. The 9V is 9V AC and is not common with pin 2 or any other pin. Pins 6 and 7 are the 9VAC output right from the PSU transformer. Verify this by setting your DMM to AC volts and measure between pins 6 and 7. There is a fuse in this line, BTW, so be careful not to pop it. Also bear in mind that if it's one of the potted supplies (heavy, very solid), it may unexpectedly fry your C64 tomorrow (or at any time). Thanks to Chuck(G) and Space Commander. I did post this two day ago, but it suddenly disappeared on me, so I reposted it. Thank you again for the info. I will confirm this with the meter. ps...I am mostly a s/w person and have recovered my C64 and V20 but get stymied by some of these issues I don't have the background for!